Clean, simple and straight to the point - this rectangular top casual dining table presents an ideal option for small to mid-sized dining interiors. The table is constructed from hardwood solids and veneers with a dark Cappuccino wood finish. A straight edge and square legs keep the look lean and mean for sensible and contemporary appeal. 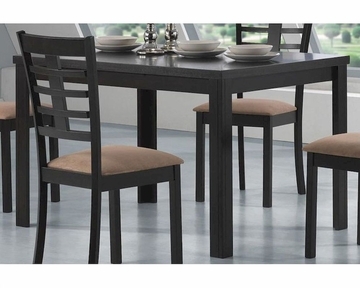 Pair with the coordinating split ladder back side chair (103982) for a complete dining set.